Beaded kumihimo is kind of a different animal (so to speak) from traditional kumihimo. It has limitations, for sure, but it also lets you explore possibilities that the regular braiding can’t touch. Or at least not without a lot more work! Glad you asked! As you can see from the samples in the photo to the right, it’s adding beads while working the braid. It can also be beads added after the braiding is done. I don’t have a sample of that yet, but I have some ideas for projects lurking in the back of my mind. If you’ve worked regular kumi, you know that you measure off your thread or cord ahead of time and then work your pattern. When using beads, you need to add those beads to the thread before you start braiding. In that respect, it’s like bead crochet. One tip that will probably make your life easier is when starting your braid, make the first inch and last inch without beads. This helps a huge amount when it comes time to putting on your end caps! Decide ahead of time how loose you want your beading, or how much thread you want to show. In the pink pattern, I did not add beads to each thread. The thread becomes part of the pattern. I also beaded looser, and used satin cord on the strands on which I didn’t have the beads. On the blue and silver braid, I had beads on all 8 threads, and I beaded tightly so that I wouldn’t have thread showing. I also used some color-lined beads to give it a little bit of a translucent effect (which doesn’t show up well on the photo — much nicer in person). As to the thread — I used C-lon, medium weight. 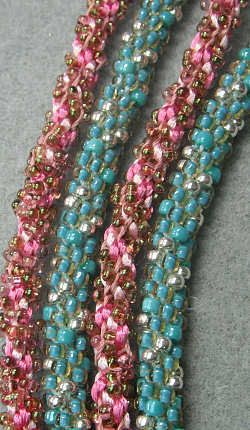 On the pink braid, I used some farfalle beads, and on the blue and silver I used size 8 seed beads. 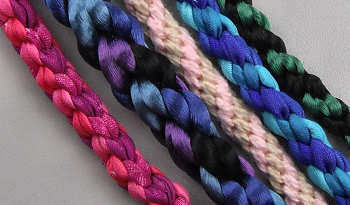 Size 6 seed beads would give you a more substantial braid, as well as being easier to thread! I’m working on a project for beading ideas, but in the meanwhile, there are two books that I bought that you might enjoy reading. 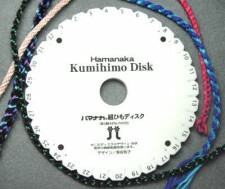 One is called Braiding with Beads on the Kumihimo Disk and the other is Necklaces Braided on the Kumihimo Disk . Both are by Karen DeSousa. I liked both books for the ideas they provided, not to mention the lovely photography. I am famous for not following instructions 100%, but instead use the instructions as a jumping off point. But there are some beautiful braids and jewelry in the books, so if you prefer to follow patterns, these are sure to please. Note: the above books kind of assume you know the basics of kumihimo, although there are some instructions. You can always take a look at the tutorial on my kumihimo tutorial page, though. That’s it for now — time to turn that blue and silver one into a proper necklace, so I’m off to finish it up. See you later! I’ve spent the last few weeks doing some kumihimo braiding, and I have been having fun. I dug out my two existing books, then got three more to boot. Not to mention a ton more silk and satin for braiding! And yes, I have even make a kumihimo video tutorial! I’ve been experimenting with a lot of materials, textures and cord sizes. 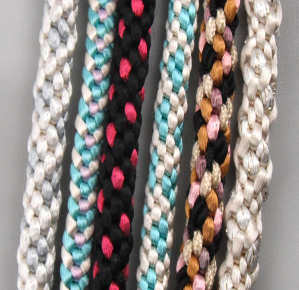 All of the braids to the right are using the same braid pattern, except for the braid that is second to the left. Otherwise, the only differences are colors and cord sizes (and of course, the way I set up my colors on the foam disk). I’ve been making these braids into necklaces as well; you see, I have a lot of pendants, especially of the beaded cabochon kind, and many of them really need a more substantial necklace to balance them out. I have found that kumihimo works up much faster than traditional beading stitches, so after completing a pendant, it’s a soothing cool-down to make the braid to go with it. 4 pieces of satin cord; I am using size 1 rattail in 4 colors (one of each): Peach, Silver, Ice Pink and Ivory. Each cord is 60 inches long. 1 twist-tie (you can also substitute a piece of wire or a piece of string). I use this to tie my cords in the middle, and so my four 60-inch cords become eight 30 inch cords. 1 piece of string, about 1 foot long. Now obviously you can use any colors you want; I just used 4 different colors so that you could see the progression around the disk. I tend to use 2 or three colors, but one of these days I am going to experiment with 5 or more colors to see what happens, LOL. I’m showing you the most basic stitch, which is what I used on most of the braids in the photo at the top of this post. You can get all kinds of looks from it, though, just by varying the materials, colors and thicknesses. And of course, I got my cord at The Satin Cord.